Skin Perfect is the only spa in the country to offer total Image Wellness™. This is a blend of beauty education, inspiration, self-acceptance coupled with a specialized treatment plan, customized products and a team of beauty professionals to help you reveal your best self. This is the best self-awareness and self-acceptance program for women in the country. These inspiring and results-oriented programs are accessible and personalized for everything from severe skin challenges to confidence-boosting radiance. Skin Perfect Medical Spa is a boutique medical spa that focuses on results-oriented treatments and customized client care. We realize how important your image is as it’s your reflection to the world. The way you feel about yourself can impact your daily life. The goal is to provide minimally invasive, no-downtime treatments that help transform your skin into the healthiest, most radiant skin. The team of skin professionals partner with you in the journey for continual improvement on your image and self-confidence to be your best self. Renowned plastic surgeon, Dr. Stephen Smith, and skincare pioneer, Jaclyn Peresetsky, have created a new standard in the medical spa industry known as Skin Perfect MD. They have pulled together the best technologies and result-based services and products to transform the largest organ of the body, your skin. Their unique approach analyzes and identifies the skin in three ways. We are the first and only skin care company to identify skin type by three categories. These three functions are critical to understanding the skin because the skin’s natural properties dictate what skin professionals need to work with and how they can improve the signs of aging. Skin Type. This is the skin’s natural pigment levels and what is a natural response to sun and heat, which is based on genetics. The client is born with their skin type and cannot change it. However, identifying this is important because it determines how the skin will behave in the sun and how the skin responds to inflammation, such as to an injury or burn. SPM uses this information to know what treatments and products work best to gain results in the skin to improve the tone or texture. The skin will always be dominated by genetic factors, so as skincare professionals we need to learn to work with them and not against them. Skin Condition. This is the skin’s appearance in which you see characteristics such as larger pores, age spots, blemishes, redness, crepiness, elasticity loss, and lines and wrinkles. We create goals to improve these characteristics of the skin over time by utilizing the ideal ingredient combination through a client’s homecare program, as well as treatment type and frequency. Skin Function. This is how the skin functions on a daily, weekly and monthly basis in response to hormones, seasons or climates, and lifestyle behaviors. Skin function can be managed and improved with the teamwork of the clients and skin professional. The commitment of the client to follow a skincare professional’s recommendation and improve their daily habits can make a huge impact on how their skin responds to the external and internal factors. Hydration and oil levels can be greatly impacted by following the right skincare regimen and skincare treatment program. Having great skin is a lifestyle choice, and we strive to provide you with the best collaboration of medical and esthetic ingenuities. 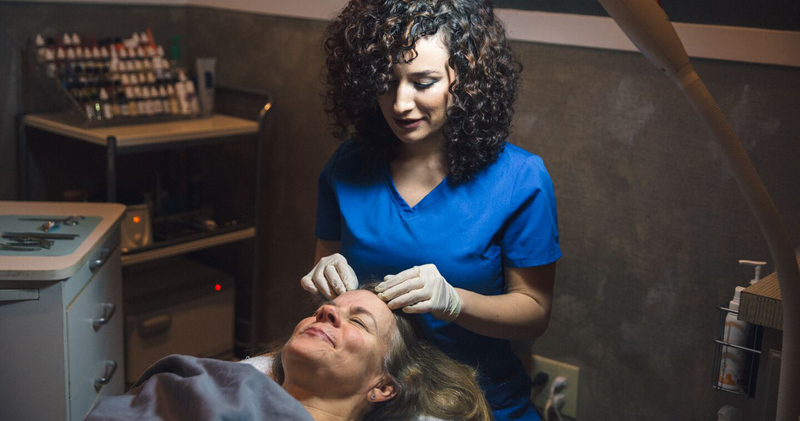 We have the top talent, most cutting-edge modalities, and innovative skincare and cosmetics to deliver incredible results from the inside and out. You can feel right at home in the facility and let us bring out the best in your skin. Along with the medi spa, we have a special color and image studio that can identify your unique coloring that helps you in choosing the best clothing, makeup and hair color.